I think it’s funny when people ask me what camera or lens that I use. One recent comment on one of my photos was “You must have a really good telephoto lens” –for the record I shoot all of my insect shots with Canon’s 100mm macro lens. It’s not the hardware that lets me get close, it’s all technique. Study your subject and learn their habits. If you take the time to get to know the critters that you shoot then your success at getting good shots of them will only improve. 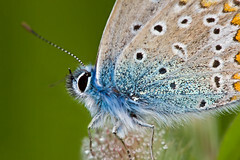 Take the Haystack Butterfly image in this post. I know that butterflies need to warm up and dry out in the morning -the previous night’s dew can get them pretty wet. They are also more likely to be feeding in the morning, and if they are busy eating they won’t mind me getting close, provided I move slow enough. So I went out early and captured this butterfly. I’ve been experimenting with water dripping from my kitchen sink lately, and doing a lot of reading about high speed photography. Even though I really don’t have the equipment to do it “the right way” I wanted to see what I could do, and maybe learn something more about flash photography. What I found out was not what I expected. 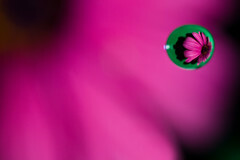 The goal was to take a photo of a water drop in front of a flower and the get the flower’s refraction in the drop. The setup is easy: Just punch a hole in a piece of heavy paper big enough to feed the stem of the flower through, and then tape the stem to the back of the paper. Set the paper in the sink behind the faucet and set the water to dripping rapidly to increase the chance that you’ll get a drop in the frame when you press the shutter release. Piece of cake, right? I knew that the shutter speed was irrelevant, since it’s the burst of light coming from the flash that freezes the water in mid fall. I needed to make that burst as fast as possible using the 430EX that I have, and the only way I could come up with and still use E-TTL flash control was to open up the aperture and increase the ISO. But the intensity of the light, and the duration of the burst, is also dependant on the distance between the flash and the subject. For the image in this post I had the camera on manual mode F5.6, ISO 200, and 1/200 of a second –but ignore the shutter since the flash is freezing the action. Initially I was shooting at F8 and ISO 100 but the drops weren’t sharp enough. Notice that I changed the aperture and the ISO to vary the exposure –not the shutter. 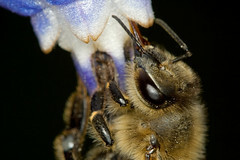 Also I had the flash about 10cm from the flower (around four inches) and I used an ST-E2 remote control to trigger it. You could use the built in flash on your camera, but glare is going to be a problem. But like most insects if they have something to do then they might just slow down long enough for me to get a shot or two. Since ants are constantly looking for something to eat all I had to do was put a little sugar water on a leaf, anchor it so the wind doesn’t blow it around, and presto I’ve got a macro studio. It takes about five minutes for the “models” to show up for the shoot. Select a leaf that has a good texture to it. Flat leaves are not only boring, but you’ll run into problems with reflections from the flash. Also choose a large leaf since you’ll need room to anchor it and still have plenty of space to move around with the camera. For the image included with this post I used a fig leaf. On hot days put your “studio” in the shade –most species of black ants don’t like direct mid day sun if the weather is hot (and it’s not good for you either). Once the ants start feeding you can move them to new area if the one you’re in doesn’t let you get the angles that you want –just move slowly. I placed my leaf on a low stone wall that surrounds my patio and sat in a chair next to it to shoot –some of the easiest macro work I’ve ever done. Use your flash as a virtual shutter. The shot in this post was taken hand held, but that's kinda deceptive. I took the image at F11 and ISO 100 plus I lost a full stop with a 1.4 teleconverter, and a little more light with a 25mm extension tube, so if the flash didn’t fire then the scene would have been completely black. The photo receptors on a digital camera's sensor are like buckets for light and you have to fill them up to get a proper exposure. A half full bucket and the image will be badly under exposed, and if the bucket gets too full then the image will be over exposed. Without the flash the light bucket is almost completely empty. So the flash is really the only source of light in an image like that one. Since the flash has an average duration of only 1/12000 of a second the flash becomes a virtual shutter -the fact that the actual shutter was open for 1/200 of a second doesn't matter, since there is very little natural light reaching the camera's sensor anyway. So, in reality, I took the photo at about 1/12000 of a second. That’s why the image is sharp, even though I didn’t use a tripod. You can use the same “trick” to take photos of water drops (the subject of a future post). You’re going to read a lot about image sharpening on the web –maybe you find yourself here because you did a search for USM and got my page. Some people will actually tell you that you have to resort to using USM just because you shoot with a digital camera. But I’m not going to tell you how to use UnSharp Mask, I’m going to tell you not to. Because you might be able to use it to make a soft image look sharper, but you can’t add information to an image that you didn’t capture with the camera –the computer isn’t that smart. You should work on your technique instead. If you take a sharp photo then there is no need to resort to tricks to make it look sharper, it’s just not necessary. Take the above image for example; I used whatever default sharpening Photoshop Elements 5 applies during RAW conversion and I ran Noise Ninja to take out the sensor noise and that’s the only sharpening that I did. 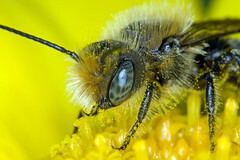 If you click on the image for a larger version you’ll see that the bee has hair growing out of its compound eye –and it was moving when I pressed the shutter button. If I can take an image like that one then so can you –I’m not special. Mark Plonsky, a macro shooter that I look up to, told me that I need to get closer and to put everything I've got between the camera and the lens. I have a great deal of respect for Mr. Plonsky -one look at his work and you should to. So here is the end result of the first outing with a Canon Xti + 25mm tube + 1.4 teleconverter + 12mm tube + lens (in that order). Manual mode F11, 1/200, ISO 100. MR-14 EX ring flash set to a 4:1 ratio. Final magnification is about 2.2 times life size.